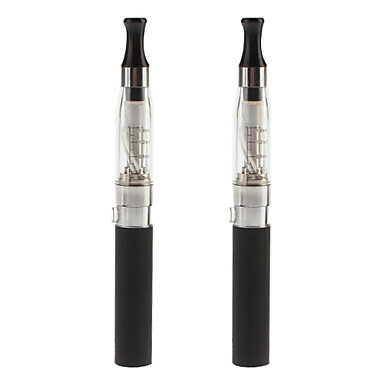 The “e cig” or electronic cigarette has become very advanced the last few years, and prices on these advanced kits have dropped considerably. Over the last 6 months I seen search term keywords to this article, views increase and many ex smokers finding and now using the advanced electronic cigarette. I quit the tobacco cigarette on 1-1-2013, by switching to the electronic cigarette. Surprisingly it was a very easy switch for me. Never looked back or needed another cigarette after using the ecig. Friends, family members asking and telling me to quit smoking, 2nd hand smoke, the smoke odor. I was a walking ashtray for years! I enjoyed it to much to really quit. As much as I enjoyed it, deep down I hated smoking also. I hated that I could not quit the addiction. I tried just about every method of quitting, and failed over and over again. I just did not have the discipline OR will power to really quit. The newer advanced, refillable ecigs and choice of flavors and nicotine dosage made it very easy for. I started on the ecig and never touched a cigarette again, simple as that. I smoked regular cigarettes for 33+ years, Marlboro, Marlboro Lights and Winston Lights and at times 1-3 packs a day. Found a ecig, ejuice store by the name of CrazyVapors here in Augusta GA. Purchased a good Ego brand ecig kit and a couple ejuice flavors from a local ecig store here in town, and that was the end of “smoking” for me. Back in January 2013 I was determined to quit this smoking habit again. Went out and purchased the nicotine patch again, I tried it before it worked, until I decided to take a puff or drag off a cigarette again few days after. So I wanted to give the patch a try again. I was fine till day 3, had a bad urge to smoke again, I left the house to go to the carryout close buy some smokes again. Just one cigarette won’t hurt right, then I’ll stop right? Wrong, been there done that. I stood there in line anxiously waiting, my anxiety was all over the place looking at those cigarettes behind the counter. I knew what I was about to do was wrong, but the habit and addiction began taking over again. As I stepped up to the counter there was a disposable electronic cigarette on the counter, instead of me asking for “Winston Lights” I grabbed the E Cig, looked at it quick and said “I’ll take this”. I rushed to my car, struggled to get the damn thing out of the package, and took my first “vape”…… “Whoaaaaa, now this I can do!” The flavor happened to taste real good, if it wasn’t for the flavor of this first “vape” I probably would of thrown it on the ground and ran back in there for regular smokes. It has now been 7 days, (update – 7 months now) I went into same carryout store earlier and left sanely without even thinking about buying cigarettes. The girl behind counter asked me “Winston Lights” (she knows me to well),, I said, “Nope, no more for me”. The disposable electronic cigarette was “Blu Cig” Brand, it was $8.99 and lasted just one day. I did some more research and found Walgreens carrys Blu Cig Starter Kits. I purchased it but do not recommend Blu Cig now, battery life only lasted about 20-30 minutes tops, cartridges did not last long and was still expensive. I knew I was going to have to find something real fast, if I did not, I be in trouble and back to smoking again. Now, several months later, trying many ejuices Mom and Pops Vapor Shop now gets my business on line. Great ejuice / eliquid custom flavors, fast shipping and awesome service for an on line business! Mom and Pop Vapor Shop – American Made E-liquid and more! Try “Tobacco Blaze”, excellent medium tobacco flavored ejuice! “Tobacco Blaze” is the closest ejuice I currently use that resembles the taste of an actual cigarette. “Buds Blend” is an excellent smooth tobacco flavor, light tobacco flavor, with a hint of light cocoa on the exhale. Excellent Ejuice! Also avalable in menthol. “Tobacco Haze” & “Buds Blend” are my regular vapes from Mom and Pops Vapor Shop. Give them a try and use the 10% off code below! The electronic cigarette or ecig is a rechargeable battery device that looks like a cigarette. Some are longer, like king cigarettes,and some are shorter. They come in different types, colors and designs just for you. All them work off a liquid cartridge or refillable liquid chamber. You “vape” it like a normal cigarette, but it is not tobacco or smoke,, it is flavored VAPOR with liquid nicotine. The nicotine level can be tailored to your liking from 0mg to 24mg and over. It is like smoking but WITHOUT the health risks to you or others as a regular normal cigarette contains. No odors, no 2nd hand smoke, no tar, no tobacco, no yellow teeth, no stinky cloths or breathe, no ashtrays anymore, no burn holes, NONE of the 4000+ poisonous chemicals that regular tobacco contains. The refillable liquid or “e juice” comes in MANY, MANY flavors from tobacco type flavors to ANY flavor imaginable – butter rum, coconut, peach grape and some wild exotic flavors to, many to try. The “e juice” is what is turned to vapor, and flavor as you take a drag off it. Just like smoking without the actual smoke, you are now “vaping”. The liquid contains the custom flavor and a dose of nicotine. 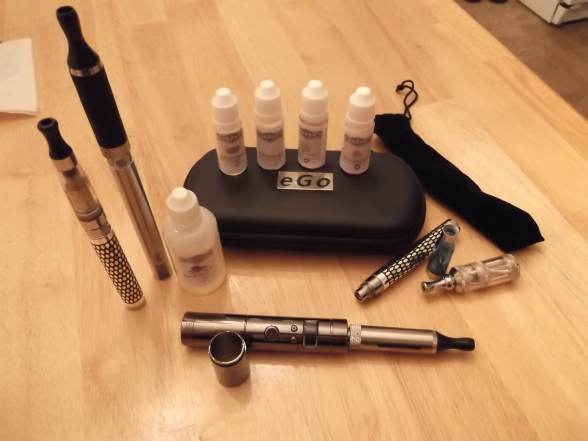 The liquid nicotine these ecig / ejuice shops mix into your ejuice flavor comes in 6mg, 12mg, 18mg, or 24mg for example. So you can either continue vaping with nicotine or ween yourself off the nicotine addiction right down to 0mg nicotine and just flavoring. Nicotine by itself virtually harmless, but it is highly addictive as us smokers are very well aware of. “Nicotine does not promote the development of cancer in healthy tissue according to studies”. Nicotine is considered a stimulant such as many items we eat, drink or consume: coca cola, coffee, mountain dew, red bull, gum, lozenges and 100+ other food or drink products. The liquid “e juice” used now a days in electronic cigarettes is nothing more than propylene glycol(PG), vegetable glycerin(VG) and food flavorings all used many many food items. With the electronic cigarette you are now “vaping” the flavored liquid vapor mixed with liquid nicotine. You inhale, you exhale just like smoking, it looks like smoke but it’s vapor,,, harmless. No 2nd hand smoke risk, no smoke odor and no poisons that the regular tobacco cigarette contains. A healthier, and MUCH cheaper way to calm the nicotine urge, and quit smoking. Dell Studio 1558 Blank Screen – Solved! Thanks for the good blog. It was very beneficial for me. Keep sharing such thoughts in the future as well. I got here! Many thanks for sharing the such information here.